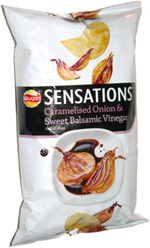 Taste test: These chips lived up to their "Sensations" name as they were absolutely top-notch in quality. The chips were cut thick and had an excellent crunch and an outstanding crispness. 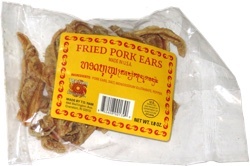 There was no greasiness at all, and biting into these was just a great experience. The great texture was matched by an extremely tasty flavoring, not overwhelmingly oniony or vinegary but just delicious. This bag did a lot of international traveling before getting opened, and yet it still had lots of unbroken chips inside, some of them fairly large. Smell test: Very nice sweet onion smell. Not really vinegary.